The PEN Ten is PEN America’s weekly interview series. This week, Hafizah Geter, editor at Little A and Day One from Amazon Publishing, speaks to Jimin Han, whose new book, A Small Revolution, was released earlier this year from Little A. When I was a child, I wished I could be anything else. I wanted to be an artist—was terrible at drawing—wanted to sing—even worse—wanted to play piano—was passably good until age nine—wanted to be a scientist/astronaut/doctor (all which would have made my parents very happy) but I was unable to do anything but read and write. My college transcript shows terrible grades in everything but courses in the English Department. And then when I was 27 years old, I went to the Squaw Valley Community of Writers Conference and discovered I wanted to spend as much of my time writing as I could. I returned to New York and applied to graduate schools. This is constantly changing. I have very conflicted feelings about a sense of home and place, which come from my childhood. Can’t shake the feeling that I’m going to lose a place I make as a favorite as I did so many times. So I’ve learned to go with it. Try to have my laptop with me so I can write wherever I am. Missing people, maybe? There’s always someone or some place missing. Maybe it’s because somewhere inside me I know what missing a place, a home, people is. We moved constantly when I was a kid. Every two years a new apartment, house. Even in the same town, we moved to a different neighborhood every two years. I was drawn to writers who expressed this concept of missing someone or some place in different forms: Kang Sŏk-kyŏng, Joan Didion, Marguerite Duras, Ha Jin. As a child I loved Sylvia Engdahl’s Enchantress from the Stars and The Far Side of Evil. I loved poetry too—Sylvia Plath, Li-Young Lee, Kimiko Hahn, Anne Carson, so many others. Probably a poem I wrote about my mother’s superstitions. It scared me because I’d never written about her that way. A toughness emerged—this steely part of her, lessons she lived by, had been told to her when she was a child. My mother was a gentle woman with a relentless center that only showed itself at particular times, and I was scared to show that part of her to the world because I thought they’d judge her. This is tricky for me because I felt so much responsibility at one point that I hardly wrote at all. My father was a well-respected physician in a small town during my teenage years and I felt like I was in a fishbowl, everyone watching me. And my father said as much too—that we represented not only him and our family but Koreans everywhere. I felt pressure to please everyone and represent the best in Koreans. All I wanted to do was write about myself though, and I didn’t know how that would be received. These days when I think about the responsibility of the writer, I think about how censorship of writers and other creative artists is one of the first actions of a totalitarian government. It speaks to the power of the individual voice, how books, art, music, etc., can influence minds and hearts. To question and empathize, offer another point of view, has far-ranging impact. So it’s important for us to continue to write and defend our rights, in whatever way we can, and not take them for granted. We work in solitude for the most part, but it’s important to work together especially as this presidency blatantly attacks the rights of its citizens, supports white supremacy, and tries to silence anyone who criticizes it. I’m so encouraged by organizations like PEN America, because the magnitude of the battle is overwhelming at times. PEN America also informs us about writers around the world who deal with oppressive regimes and connects us together as writers with a common passion and supports our speaking out against injustice. Writers in communities of color, particularly women and LGBTQ+. Growing up as I did primarily in the northeast part of the United States, there was a lot of confusion about whether something was racist or not. Except for the few times it wasn’t. But the subtle ones were confusing, I have to admit. I was educated to downplay my suspicions, to believe in a more caring society. I’m saddened and anxious to see flagrant displays of racism and bigotry now—some people acting as if it’s acceptable. I feel more fear, an unnerving kind of fear now. As for my writing, I’m reminded how important it is for me to try to do better in my work. To write better, to understand what I’m trying to say better, to be as informed as I can be about what’s happening around us and participate in supporting what’s just. I’m fortunate to work at the Writing Institute at Sarah Lawrence College where the director, Patricia Dunn, and I started the Wrexham Road Reading Series to bring writers from within and outside the college community to share their work and speak about their reactions to current issues. One book . . .? Tough question. Empathy seems to be what these leaders lack. So I’d send Chiwan Choi’s The Yellow House and Claudia Rankine’s Citizen: An American Lyric. I’d also throw in Eve Ensler’s I Am an Emotional Creature—a catalog of girls’ voices from around the world. To me the distinction is that surveillance seems indiscriminate and all-encompassing and violates privacy. And what happens to all that data that is collected? Who is using it and to what end? Jimin Han received her MFA at Sarah Lawrence College and her BA from Cornell University. 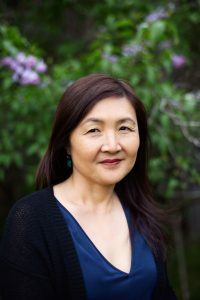 Her work appears in NPR’s Weekend America, Entropy, The Rumpus, HTMLGiant, The Good Men Project, Kartika Review, The NuyorAsian Anthology, and KoreanAmericanStory.org, among others. She teaches at Sarah Lawrence College’s Writing Institute and lives outside New York City with her husband and children.